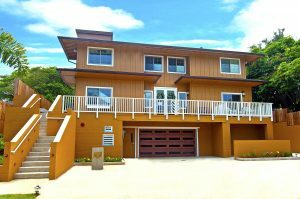 When in-home care is no longer appropriate, come see Wilson Senior Living, our state-licensed Adult Residential Care Home (ARCH II), located in the Aikahi neighborhood of Kailua at 96 Kaneohe Bay Drive. This beautifully appointed state-of-the-art care home welcomes individuals in need of care around the clock, but do not require skilled nursing care on a regular basis. 22 residents enjoy our 11,000 square foot home, with welcoming common areas and private, fully-furnished bedrooms with private bathrooms. Each room is equipped with a call system, electric Tempur-Pedic bed (unless hospital bed is appropriate), flat screen tv with basic cable, Wi-Fi, landline phone with discreet number, desk, chair, dressers, built-in closet system, remote-controlled air conditioner and ceiling fan. Call our office at 808-596-4486 to schedule a complimentary tour or visit our contact page to email us. Wilson Senior Living Kailua residents live “family-style,” welcoming each day with purpose and giving ‘senior living’ new meaning. It’s a home. Make it your home, today! Our person-centered care is inspired by a social model with encourages seniors to maintain as much independence as possible while actively participating in daily life here. At Wilson Senior Living, residents and staff become family, enjoying meals, activities, and visitors together each day. 596-4486 or click Contact Us to send us an email. This is no ordinary senior living facility! Come and learn more about our care home today! Wilson Senior Living is located on the windward side in Kailua, on the island of Oahu, Hawaii. Our address is 96 Kaneohe Bay DR Kailua, HI 96734. Our phone number is 808-596-4486. Take the Pali Highway to Kailua. After the tunnel, on the Windward side, take a left on HI-83N/Kamehameha Highway. Merge onto H3 via the ramp to Kailua/Kaneohe MCBH. Follow signs for Kaneohe Bay Drive. This is Exit 15. Take Exit 15 and turn left on Kaneohe Bay Drive. We are .4 miles ahead of you on the right. Take H3, following the signs for Kailua/Kaneohe MCBH. Head down N. Kalaheo Drive toward Kaneohe. Cross Mokapu Blvd (the Aikahi Safeway will be on your right). Drive past the next stoplight. Our Home is a block or two ahead, on your left. Turn left onto Kaneohe Bay Drive. Make a U-Turn at Kapalai Road. Take a left turn onto Kaneohe Bay Drive. You can either stay on Kaneohe Bay Drive until you reach our Home (it will be on your right) or you can go onto Mokapu Saddle Road, continue onto HI-630E/HI-65E/Mokapu Saddle Road. 1. Then turn left on Kaneohe Bay Drive. 2. Go past the next stoplight intersection and we’re a block ahead on your left. 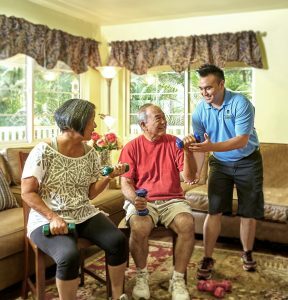 Call us at 808-596-4486 to learn more about our home care agency or our care home. Or click on Contact Us for more information. Click here to take a Photo Tour of Wilson Senior Living.